*What Attachment Type Do You Use? A must have for anyone who is installing hair extensions, be it micro ring loops or I tips. More importantly, if you are a hair dresser or run your own hair salon, then having various size beads on hand will help you to enjoy a headache free day. Unlike other providers, we offer one of the biggest selection of micro rings and beads on the market, just select the type and follow instructions. AiryHair micro and nano rings are the perfect choice for extensions application and come in a variety of colors and materials. 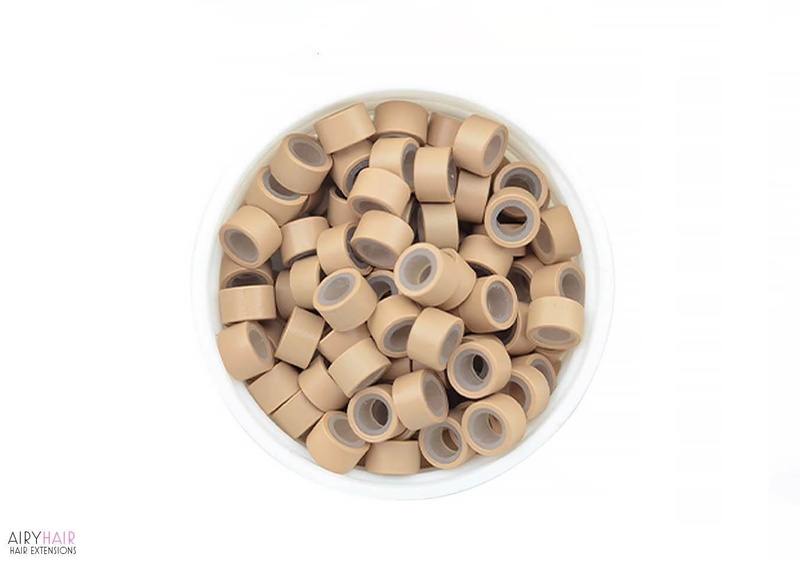 Both copper and aluminium rings are fitted with silicone in the inner part which ensures that the hair inside does not get damaged and provides a better grip on the hair. That is very important because nobody wants extensions that fall out. These micro beads stay in place and there is no way they will get loose. The silicone enables great results even for oily and hard to grip hair. Aluminium and copper are both great materials which will not get damaged or scratched when washing extensions and doing regular maintenance. They are made to last for a long time and color will not wear off. Different color options, from blonde to black, ensure that the rings will not be visible because you can perfectly match them to the color of the hair. Micro Rings vs. Nano Links: What's the Difference? The rings come in two different sizes: micro and nano rings. They work the same, but nano rings are slightly smaller and because of that are usually recommended for people with thinner hair since micro rings could be visible if the hair is not as thick. Because of their size, nano rings are also slightly more comfortable to wear. One downside of nano rings is that they have to be taken out and reapplied after the hair grows out while micro rings are simply pulled up. Both are great options, and if you’re a hair professional you should definitely have micro and nano rings available for your clients to choose from. If you’re a hairdresser, AiryHair beads are a must-have for your salon. Make sure to stock up on different sizes, materials and colors in order to offer your clients as much variety as possible. Both small and big quantities are available for purchase. How to Apply Micro or Nano Beads? The installation process is actually pretty simple. Small strands of hair are fitted through micro or nano rings. Using special pliers, the rings are shut tight on the roots of the hair. The reason why this extension method is so popular is because it doesn’t require glue or clips. Micro beads also provide a more natural hair movement and they totally blend in. Once the hair is installed, there is no way the rings will come off, making micro ring one of the most secure methods available. It is also very long lasting and you don’t have to worry about taking your extensions off every day. Micro ring extensions can last up to several months, depending on how fast your hair grows. After that, they need to be refitted. How to Remove Micro or Nano Beads? Micro and nano rings are also very simple to take out because there is no glue involved. The rings are pressed with the pliers and they open, making it extremely easy to take the hair out. Because of this simple removal method, there is no hair loss or damage to the hair. Please choose from the two shipping methods we offer. • Free shipping: we offer free worldwide shipping by registered air mail. If you decide on this method, your rings will be at your doorstep in 10-20 days. • Express shipping: if time is of the essence for you, please use the express shipping method. Your beads will arrive within 2 to 5 business days. One thing that stood out to me right away was the price. Since you get a thousands of copper links per package, the price is pretty good. That’s why I ordered right away. The deal was really good and I’m glad I ordered.